Our favorite songs are like a friendship that stays with us forever. So we asked our fans, “What are your favorite childhood songs?” and we received a bunch of great responses! Next, we recorded those suggestions with a splash of Learning Station upbeat fun, a dash of silly, a large dose of active movement and a generous amount of inspirational tunes. Grownups won’t be able to resist joining in with their kids for these lively dances, sing and play along activities, and tunes! Revisit old musical memories or create some new ones with this sparkling collection of our 15 special gems! Part of The Learning Station’s campaign that supports, Healthy Music for a Child’s Heart, Body and Mind! 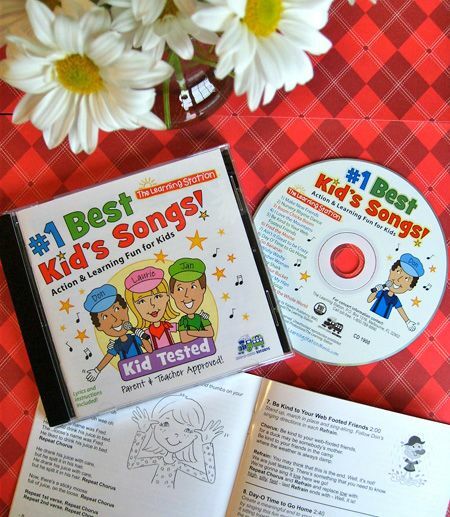 PreS-Gr 3–The Learning Station team (Laurie Monopoli, Don Monopoli, and Jan Hrkach) have put together another excellent album of 15 favorite childhood songs that will get kids moving and dancing. The accompanying booklet contains the lyrics to each song as well as instructions for movements and dances. The band uses a wide variety of musical styles, including Motown, funky hip-hop, rap, novelty, folk, and rock. The excellent vocals are especially well-performed, as the vocalists adapt their voices with ease to the various musical styles. An enthusiastic children’s chorus enhances the songs. The playlist includes “Make New Friends,” “Nursery Rhyme Dance,” “Boom Chicka Boom” (with various sound effects), “Be Kind to Your Web-Footed Friends,” “Ain’t It Great to Be Crazy,” “Day O’ Time to Go Home” (the group’s version of “The Banana Boat Song”), “Baby Shark,” “Rockin’ My Hips” (adapted from “Rock a’ My Soul”), “Stone Soup,” and others. This album encourages listeners to move and dance and will be a great resource for librarians, teachers, and parents. Wow! What A Great New CD!!!! We just love #1 Best Kid’s Songs! It is upbeat, it is familiar and it’s just simply fun to use in the classroom. On our last day of school our principal played “Day O’ Time to Go Home” over the intercom and we danced our way out the building to Summer Vacation!!!! I am looking forward to introducing this CD to this year’s new students. I know they will so love, “Make New Friends”, “Boom Chicka Boom”, “Wishy Washy Washer Woman” and of course “Go Bananas” (AREN’T WE ALL A LITTLE BANANAS? ), heck they are going to love all the songs! Also, another thank you for adding videos on You Tube, what a perfect demo resource, I encourage all to check it out and you to add more!!! LOVE IT, LOVE IT, AND LOVE IT!! !